Welcome to the Tuscaloosa Disc Golf Club website! Below you will find directions to the course at Bowers Park. 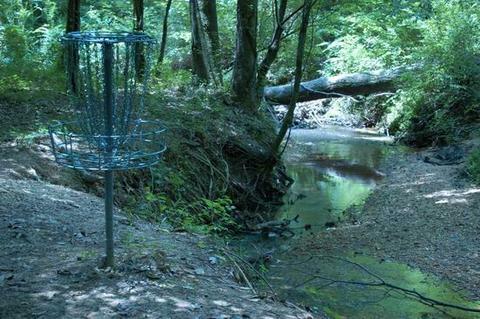 The Bowers Park Disc Golf Course is located just off of I-59/20 at the McFarland Blvd exit. If you are South/West bound, exit and turn right. Go to the next light and turn right. The entrance to Bowers Park is a half-mile or so on the left. Once in the park, the road will bend sharply to the right and you will be able to see some of the first few holes/baskets to your left. The first tee is next to the big message board to the left. If you are North/East bound, exit and turn left. Go under the interstate, drive to the second light and turn right. The entrance to Bowers Park is a half-mile or so on the left. Once in the park, the road will bend sharply to the right and you will be able to see some of the first few holes/baskets to your left. The first tee is next to the big message board to the left. If you are coming from The University of Alabama campus, go South on Hackberry Ln. Shortly after crossing 15th St., stay left to get on Hargrove Rd. Stay on Hargrove Rd. (cross McFarland Blvd.). At the third light after McFarland, you will see a Citgo gas station. Stay right and the entrance to the park is a half mile on your right. Once in the park, follow the one way signs to the right and go around the ball fields. The first tee is on the opposite side of the ball fields from the Hargrove Road entrance. The coordinates near the first tee are N 33° 10.615 W 087° 30.815. You can use those coordinates with Google Maps to find your way.